I have been very much intrigued and disappointed by one of the most respected names in European football, Sir Clareance Seedorf. Yeah, he got knighted last month for his on and off the field achievements. Seedorf has been playing for Milan for more than a decade and he rarely missed a game due to injury, a physical phenomenon that collected the highest number of caps for the Diavoli among the non Italian category. Whenever he is shown on TV commentators scream about his 4 CLs with three different teams achievement. Fair enough, he won them but there is more than what meets the eye. He is one player who had every single characteristic of a great midfielder. When he was at his peak he had power, strength, footballing brain, every inch of his body is filled with footballing skill, he can play joga bonito or your scrappy midfield game, he’s versatile and can instantly fit any system. If an alien recommend me a body to create/adapt/evolve a new generation football player I will surely put Seedorf at the top of the list. But the irony is that if my young nephew asked me about the greatest midfielder I ever saw or loved, without any hesitation I would say Zidane or scream Rui Manuel César Costa again and again because he made me cry. With all his qualities Seedorf doesn’t make me sit on the edge every single moment when he is on the field even though he is very much capable of doing that. Ah football of the 90s I miss you. Seedorf was a young prodigy at the great school of Ajax FC where he won a CL title in 1995 against us and got transferred to Real Madrid via Sampdoria where he feasted on a couple of league titles and another Champions League. I don’t have much thoughts on his days as a Blanco and I wouldn’t comment on it except that he won a lot yet he is not considered anything there. Then he transferred to Inter Milan, endured a not so good time at blue side of Milan and finally in 2002 he became a Milanista. Under Carlo Ancelotti he was a part of that great squad, one of the most versatile and greatest teams of the last decade, a formidable defense boasting some of the greatest names in football history, with Dida, an attacking force of Sheva, Pippo and Crespo. But the real strength was that beastly, godly, aesthetic midfield because it was adorned with two supreme number 10s: Rui Costa (at his twilight) and Seedorf, Kaka, class A destroyer Gattuso, solid Ambrosini, lightning wingback Serginho and a technically gifted Pirlo who was castled in deep midfield and could distribute the ball in his heyday as well as anybody (I am not a fan of Pirlo because he hasn’t done anything worthwhile after opponents started chasing him out of his comfort zone). That team was built to fight on any terrain against any opponent, anytime. Sadly, we underachieved a lot and I still hold some grudge towards our former coach big Carlo; such a nice man but he lacked that killer instinct to unleash reign of fire on anything and everything in Europe. I don’t want to be ungrateful for 2 Champions Leagues and one Scudetto at a time when it was infested by the Juve – Inter court referee duel, but a dropped CL in 2005, the Deportivo debacle and Europa League doesn’t make make me too happy. I digressed from the original subject, but you can’t blame me because I was always enchanted by that team. 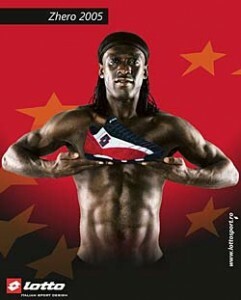 So here is Seedorf, who seems to play decent football when we are in the semis or finals of a major championship. Some call him a Big Game player; others, like me think ‘it’s about time Clarence, it’s about time’. If you follow him day in and day out like me or the Curva Sud you know how bad, frustrating and infuriating he can be all year long, lacking mobility, dedication or intention to stamp his authority on the game. I was never angrier than when he was the laziest player in that infamous Maldini farewell game against Roma. For a player who wears number 10 and starts every single game for one of the greatest clubs, he has been mediocre to hapless week in and week out for many campaigns. But there is this aspect of him which is known only to us Milanista’s and which is so unique in this guy. Push him to the limit and he will deliver, as soon as he sniffs a title he goes for the jugular. In the 2007 CL semifinal against Bayern Munich he combined well with Kaka to bring us closer to our 7th Champions League. When Ronaldinho was brought to Milan, Seedorf wasn’t the indispensable partner of Kaka anymore so what does he do? 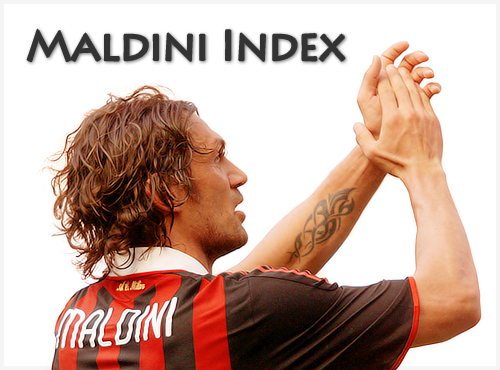 Play a screamer of game against Inter in the derby in Pirlo’s role, where he adapted and excelled like a true star. When asked about his completion with Ronaldinho, he claimed he is much more of a central midfielder. After he fought back for his starting position when Dinho was out nursing a knee injury we started to see the usual Slowdorf back in games. He is one player who has kept his place even with so much transition in the coaching position. Ancelotti loved him, Pirlo and him were his boys. Carlo overlooked their mistakes and burned Gourcuff for them, after all the coach won titles with them. Then came our caretaker coach, Leonardo, who had a rough time with Zambrotta and Gattuso but Seedorf the charmer was still unquestioned. Then the field marshal (ahahha) Allegri was given command to bring trophies, who is the coach with the lowest bias, who favors consistency and hard work over anything. Seedorf had a tough time regaining his starting position, but he managed it well. Being his last year of contract, he stepped up big time in the final half of the season and made up for the disastrous first leg against Spurs with a resounding second leg. But it was not good enough for another CL run. That was the day we saw the rise of the majestic Dorf. He started to be one of the influential players in midfield, he surprised me with his dogged performance and ability of holding the ball even under heavy pressure, a few effective tricks here and there, wily through balls and free kicks. He became one of the creative outlets of this solid Milan midfield. With every passing week he started gaining respect and love from Milanistas. Milan fans are so fickle at adoring their heroes; one good game and everything is forgiven, even the skeptic like me is thrilled and pumped up after his strong showing although I know a contract form him means more of that inconsistent Seedorf. But I hope he leaves Milan as a hero or we resign him at a lower wage and keep him on the very edge. He recently poked Milan for not assuring him another two year contract. 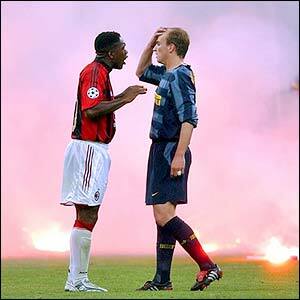 Aah Seedorf, you are such an interesting player. I never mentioned that Clarence is too old (around 35) and we never had enough cover to provide him some rest and it’s not his fault that he starts 30 odd games every year and he is bound to have many bad games at this time of his career. These are valid points but the fact of the matter is that he rarely plays with conviction. He is a mix of a champion and a culprit and he has complete control on whom to summon and when. Champion summoning usually happens when he is near some personal (contract / starting line-up) or team (Champions League / final half of the season only if you are top of the table) glory. He is a man who doesn’t settle for mediocrity (according to the Clareance standard), like CL qualification, farewell games, cutting down the lead of the opponent. He is capable of playing great games unlike many other yesteryear heroes such as Andrea Pirlo who works 10x more than Seedorf yet italian is not capable of putting up a show against tough opponents, able to stamp his authority on a game or entitled to the world master or controller or a hard game. Pirlo has digressed into a sniper who is able to deliver few lethal shots once in a while and the team should make them count. 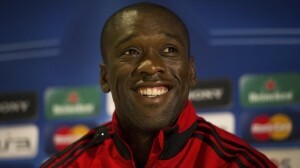 Seedorf can take the game by the scruff of the neck to unleash a masterful show whenever he wants. I think he has figured out everything; he wants trophies and to keep playing and anyone or anything that comes in his way will be shown who he is (like the lioness when somebody attacks the cubs). He will even take a pounding to prove that point. A great player who could have been the greatest, but I am delighted to have him at least this year because he has been so good. Maybe I am writing this post to reduce the guilt I have for ridiculing him day in and day out for all those sub par performances but when great memories are revisited he will always be remembered for the part he played and that evergreen blissful smile. One thing I have to admire is his statesman like demeanor (except for kicking water bottles when he was subbed for Pato in 2008 – see what I did there). He always calms agitated players: Gattuso screaming at Poulsen, Gattuso having a go at Pato. Always there to talk with officials, mediating or soothing a highly volatile situation. The man commands respect for his character. I see him as a Milan director in the future if he doesn’t run for UEFA, FIFA or the US presidential role. Thanks Seedorf for all those bittersweet memories. I will not forget you. Have a great future, I will not miss you as a player but I will surely miss your smile.